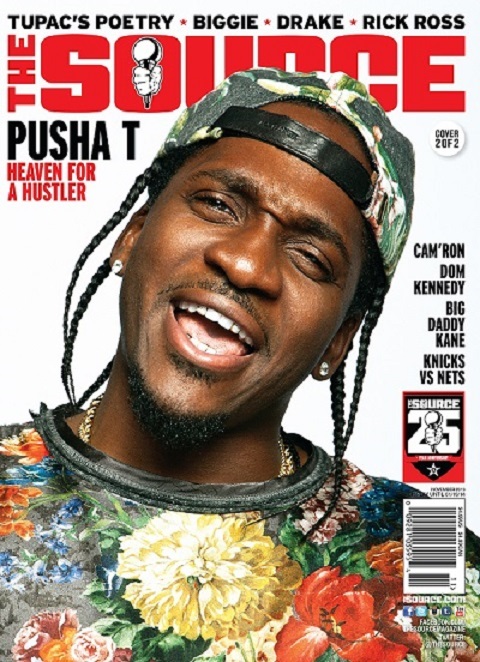 Miss Info does the honors of unveiling The Source’s second cover with Pusha T for the magazine’s upcoming November 2013 issue. The artwork showcases the G.O.O.D. Music rapper decked out in a designer flora print T-Shirt and matching hat as he poses from the camera with a look of laughter. Fans can pick up The Source’s latest issue when it hits stands on November 26. Also, take a look at some exclusive behind the scenes footage of Pusha posing with a snake for a few photos. This entry was posted in Artwork, Video and tagged artwork, hip hop, Interview, My Name Is My Name, photo shoot, pusha t, rap, the source magazine. Bookmark the permalink. VIDEO: M.I.A. & The Partysquad – Y.A.L.A.